fast shipping excellent seller! Cleans better than standard machine! 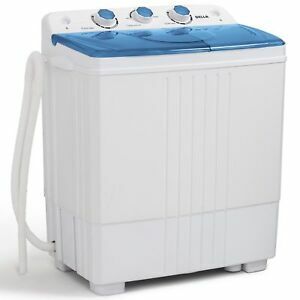 Very nice washer, fast cycle, easy to set up and move around. Fast shipping!AAAA++++Works great, love it!! Love this little machine, very easy to use and holds a lot. Washed my items completely, drains fast and the spin compartment does an excellent job, almost completely dry! Great for small apartments. Very quiet, too. Made laundry fun to do! Lightweight and so easy to use. This Washer gets clothes cleaner than a regular washer. I was so impressed. Gifted to my Brother for his Apartment. Was a gift and she loves it. I've had one for 4 years. Could not do with out it.